Harold Pollack once told his colleague, offhandedly, that all the financial advice you need "is available for free at the library, and you can fit in on an index card." Then, he sat down to prove it. 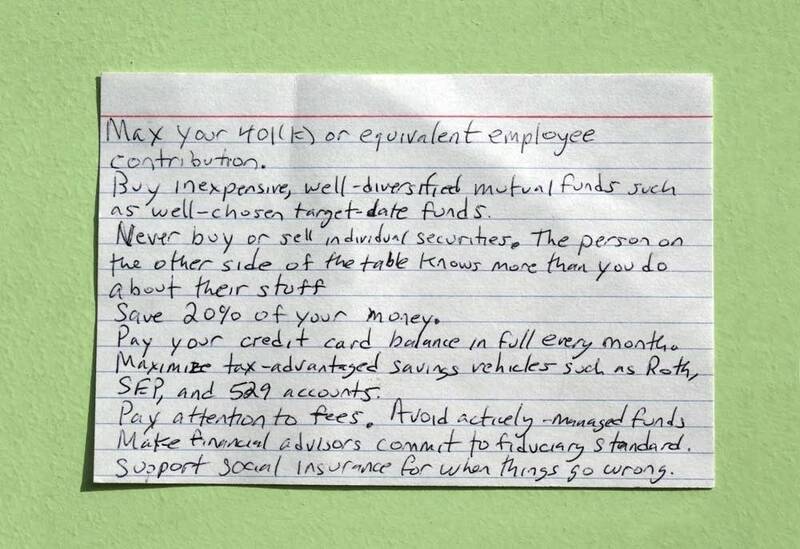 Pollack, a professor at the University of Chicago, grabbed an index card from his daughter's school supplies, spent 2 or 3 minutes sketching out his golden rules of personal finance, and posted it to the internet. The pocket-sized advice went viral, and now Pollack has published a book, "The Index Card: Why Personal Finance Doesn't Have to Be Complicated." The colleague who sparked the conversation, Helaine Olen, is the co-author. "I think it struck a chord because there's so much complexity that people feel intimidated about," Pollack told MPR News host Kerri Miller. "But you only have to understand a handful of basic things, which makes it so much more approachable for people." The most important of the index card guidelines is the one many Americans do not follow: "Pay your credit card balance in full every month." "Credit card debt is so deadly," Pollack said. To hear the full discussion on personal finance with Harold Pollack, use the audio player above.